Alpha Phi Gamma National Sorority Inc.
Alpha Phi Gamma National Sorority, Inc.
3/1/2019 – The Alpha Phi Gamma Foundation believes that investing in our members’ academic and leadership goals will not only help them achieve individual success, but also help their communities prosper. The Foundation scholarships will help members currently attending school pursue full-time undergraduate and graduate degrees. Scholarships may be used towards academic expenses including tuition, course-related fees, and books and supplies required for course enrollment. Visit Alpha Phi Gamma Foundation‘s website to learn about the cause and how you can donate. 6/24/2017 – National Board is proud to announce they will be hosting the 2018 National Conference in Orlando, Florida! Stay tuned for updates regarding conference registration and more. 6/23/2017 – Congratulations to our newest Chapter – North Carolina State University! Inducted into the Sisterhood as our Nu Chapter! 6/23/2017 – Congratulations to our newest Chapter – University of Minnesota, Twin Cities! Inducted into the Sisterhood as our Mu Chapter! 5/21/2017 – Congratulations to our newest Colony – Arizona State University. Welcome to our Sisterhood! 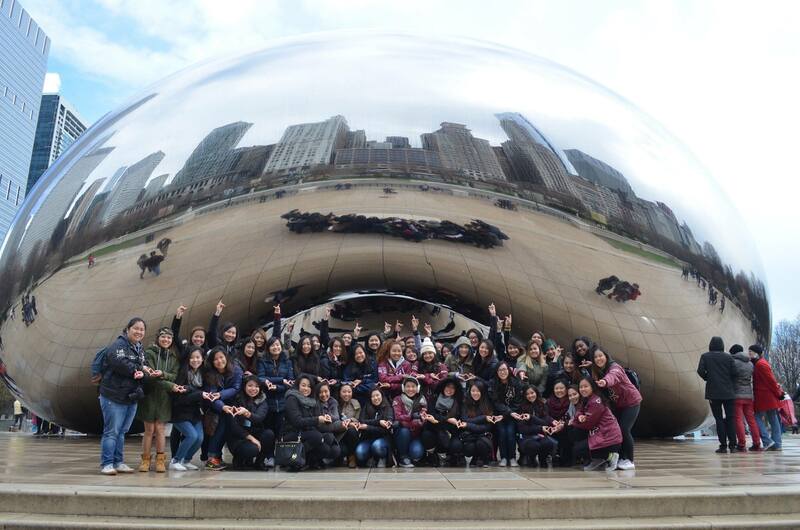 6/14/2015 – Congratulations to our newest Chapter – University of Illinois, Chicago! Inducted into the Sisterhood as our Lambda Chapter! 6/14/2015 – Congratulations to our newest Colony – North Carolina State University. Welcome to our Sisterhood! 6/15/2014 – Congratulations to our newest Colony – University of Minnesota, Twin Cities. Welcome to our Sisterhood! 4/10/2013 – Alpha Phi Gamma Sisters across the nation are joining forces to host their first uniformed annual philanthropy event, APhiG Speaks, in support of the fight against violence towards women. The event will take place on at all campuses Nationwide. Press Release. 10/28/2012 – Alpha Phi Gamma, Inc. is officially recognized as a National Partner of SAALT (South Asian Americans Leading Together). 10/01/2012 – All Alpha Phi Gamma, Inc. locations are participating in a variety of events related to our National Philanthropy in an effort to build awareness and support for the Fight Against Violence Toward Women. Please contact each of our local schools for more information regarding events. 06/18/2012 – Congratulations to our new National Board members for 2012-2013. 06/16-6/17/2012 – Conference 2012 was a BLAST! Thank you for all the Sisters who joined together at Conference. We hope you all made wonderful memories & more everlasting NATIONAL Sisterhood bonds. Many thanks to Epsilon Chapter for hosting Conference in Chicago this year. And thank you to National Board for hosting our first ever Alumni Conference. 06/16/2012 – Congratulations to our newest Chapter – University of Nevada, Las Vegas! Inducted into the Sisterhood as our newly Iota Chapter! 02/26/2012 – Congratulations to our newest Colony University of Illinois, Chicago. Welcome to our Sisterhood! 08/01/2011 – Congratulations to our newest Colony University of Nevada, Reno. Welcome to our Sisterhood! 07/01/2011 – Congratulations to our new National Board members for 2011-2012. 07/06/2010 – Congratulations to our new National Board members for 2010-2011. We’re looking forward to great things and wish you all the best of luck. 07/01/2010 – Conference 2010 was a success! Thank you for all the Sisters who joined together at Conference. We hope you all made wonderful memories. Many thanks to Delta Chapter for hosting Conference in Arizona this year. We’re looking forward to our next Conference to be hosted by Gamma Chapter in San Diego! 06/28/2010 – A big CONGRATULATIONS to our Sisters at Colorado State University on receiving Chapter status and becoming Theta Chapter. Great work, Sisters! 6/25-27/2010 – Conference 2010 will be hosted by Delta Chapter in Arizona. Register now Sisters! 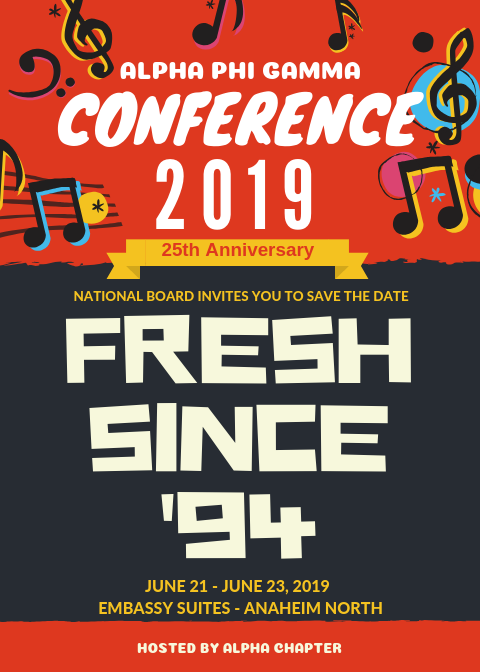 You don’t want to miss National Conference! 05/01/2010 – Asian Pacific American Heritage Month (APAHM) is celebrated in May to commemorate the contributions of people of Asian and Pacific Islander descent in the United States. See our new Cultural Awareness page for more details. 04/25/2010 – Alpha Phi Gamma, Inc. welcomes our newest Sisters of the UNLV Charter Class. Congratulations girls and welcome to the Sisterhood! 3/1/2010 – Alpha Phi Gamma, Inc. will be participating in International Badge Day on March 1, 2010. This annual event was created by the National Panhellenic Conference (NPC) during which sorority women everywhere honor their Greek affiliations by wearing their badge or letters. This year’s theme is “Keep Your Fraternal Experience Close to Your Heart.” For more information, go to the NPC website. 02/01/2010 – HAPPY BIRTHDAY Alpha Phi Gamma, Inc. Celebrating 16 years of Sisterhood with festivities across the nation and still growing strong. Thank you to our Founders for bring this Sisterhood into fruition. Much love to our Sisters across the world for continuing to make this organization what it is today and for many years to come. 08/2009 – Alpha Phi Gamma was contacted by Audrey Magazine regarding an article for Domestic Violence titled “Protecting Our Youth”. See the article in the magazine for quotes from our National President and Vice President. You can get a copy of the Magazine at Barnes and Noble bookstores. 11/2009 – Alpha Phi Gamma strengthens their committment to the Fight Against Violence Towards Women by becoming a member of the National Coalition Against Domestic Violence (NCADV). 07/17-19/2009 – National Conference was hosted by Alpha Chapter in Arcadia, CA. Thank you for a job well done! A big congratulations to University of Missouri receiving Chapter status and becoming the new Eta Chapter. Great work, Sisters! 07/2009 – Congratulations to the new National Board 2009-2010. 02/01/2009 – Happy Founders Day to all our Sisters across the nation. This year we celebrate Alpha Phi Gamma’s 15th year. It’s been a long journey since our founding at Cal Poly Pomona. Alpha Phi Gamma will continue to strive to be the best we can be. The F.Y.I. Newsletter is a monthly publication written by the F.Y.I. Newsletter Team made up of our very own Alpha Phi Gamma sisters. This newsletter spotlights sisters from different chapters/colonies and also highlights events that our sisters are putting all over the nation! In short, this is a way for all of us to keep up-to-date what’s going on with each other. Have content for next month’s issue? Submit it here! Read Past FYI Newsletters Here! On behalf of National Board, we would like to thank you for reading the FYI Newsletter. We hope that you enjoy it! If you have any questions, comments, suggestions, or concerns, we would love to hear it from you.